Not to be confused with Xabi Irureta. This name uses Spanish naming customs: the first or paternal family name is Iruretagoyena and the second or maternal family name is Amiano. 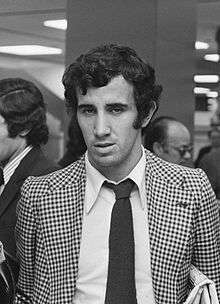 Javier Iruretagoyena Amiano (born 1 April 1948), Irureta for short, is a Spanish retired football forward and manager. He had a distinguished playing career with Atlético Madrid and Athletic Bilbao, playing in 344 La Liga games for both teams combined, and scoring 70 goals. Irureta managed several Spanish top flight clubs, most notably Deportivo de La Coruña. He is the only person to have coached both the two major Galician (Deportivo and Celta) and Basque (Athletic and Real Sociedad) sides. Irureta was born in Irun, Gipuzkoa, making his senior debut for local team Real Unión in 1965. Two years later he helped it reach the second division play-offs, before joining Atlético Madrid later that year. During his time at the club he was part of a team that won two La Liga titles and a Copa del Rey, playing alongside the likes of Adelardo, Luis Aragonés and José Eulogio Gárate. The Colchoneros also reached the European Cup final in 1974, but after the winners, FC Bayern Munich, declined to participate in the Intercontinental Cup, they were invited as runners-up: facing Club Atlético Independiente of Argentina the side won 2–1 on aggregate, with Irureta scoring one of the goals in the 2–0 second-leg home success. After eight seasons at Atlético, Irureta returned to the Basque Country and signed for Athletic Bilbao. The highlight of his career there was winning two runners-up medals in 1977 – Spanish and UEFA Cups, as among his teammates were veteran José Ángel Iribar and an emerging José Ramón Alexanko. Irureta retired in 1980 aged 32, with more than 400 official matches to his credit and nearly 100 goals. Irureta won six caps for Spain in a three-year span (exactly two years and 11 months). However, he did not experience a successful time with the national side, and never took part in any major tournament; his debut came on 23 May 1972 in a 2–0 friendly win with Uruguay, in Madrid. Towards the end of his playing career, Irureta also played one game for the Basque Country national team. As a coach, Irureta started with lowly Sestao Sport Club and joined CD Logroñés four years later, then led Real Oviedo to a sixth-place finish in the 1990–91 season, with subsequent qualification to the UEFA Cup – he repeated the feat with Celta (where he was awarded Manager of the Year titles by both Don Balón and El País) in 1998. In the 1994–95 campaign he briefly returned to Athletic Bilbao, then coached neighbours Real Sociedad. However, Irureta's greatest successes came with Deportivo de La Coruña where he spent seven years, winning another Don Balón coaching accolade in 2000. In his second year he led Depor to its first ever league title, adding runner-up finishes in 2001 and 2002 and third-places in the following two years, while also achieving UEFA Champions League quarterfinals in 2001 and 2002 and the semifinalis in 2004; in 2002 the club also won the domestic cup, beating Real Madrid at the Santiago Bernabéu Stadium. Irureta was appointed at Real Betis in June 2006 on a one-year contract, being sacked on 21 December after the club's poor start to the season. He stated: "My contract has been rescinded by mutual agreement but I made the first move. We could have continued like this for much longer but it wasn't good". In October 2007, Irureta put his name forward to be the new coach of English side Bolton Wanderers, but lost out in the running to Gary Megson, and was also touted by December as possible replacement for Real Sociedad's Chris Coleman. Eventually he took over at Real Zaragoza, replacing Víctor Fernández. However, on 3 March 2008, after merely one 1/2 months in charge, he resigned, arguing that never, as a manager, had he lost four games in a row, and that he did not feel up to the task of stopping the side's slump into the relegation zone (eventually, the Aragonese were relegated). He was quickly replaced by former Zaragoza goalkeeper Manolo Villanova, whom at the time coached SD Huesca.